I was recently selected to become a Purex® Insider so I would have the opportunity to share with you exciting new products released from Purex. If there is one thing that I am an “expert” on it is doing laundry. This week I had 14 loads of laundry before I could call it a day and when I turned around the hampers were already filling again. To keep up with my laundry, I rely on using the best laundry products available to keep our clothes and sheets smelling fresh and clean. My husband works as a printing press operator and one thing that he really likes for me to do is to make sure that his clothes are soft because his work clothes fabrics have a tendency to become as hard as a rock if I do not use a fabric softener. I used the new Purex® Complete Crystals Softener on his clothes and at first I was worried that the “Fresh Springs Waters” scent would be too overpowering but it wasn’t. After the clothes were dried it had just the right fresh scent and his work clothes were much softer than usual. I really like the idea of a crystal softener and it is very easy to use as you just add it directly to the washing machine drum (don’t add to the liquid softener dispenser). I folded it and left it for him to put away and I actually caught him sniffing his pants (quite a sight…I must say). He asked if I was using something different and stated that it “smells great” so I was relieved that it passed his approval as he can be quite picky about using new products. 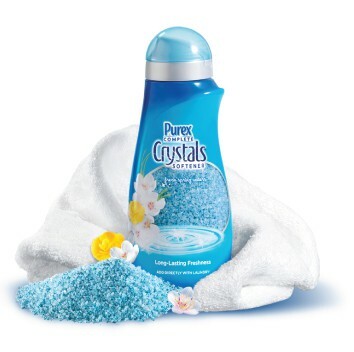 According to the manufacturer, Purex® Complete Crystals Softeners are safe for all fabrics and is different from other oil based softeners in that it won’t break wear down or discolor fabrics. I was very interested to read in the information provided that it will not cause towels to lose the absorption abilities and that is fantastic since I typically don’t use fabric softener on towels for that exact reason. Purex® Complete Crystals Softener will be available at food, drug and mass retailers nationwide and are affordably priced from $3.99-$5.99.